Danone has branded its sponsorship of Barnardos Ireland’s Big Toddle event running in 2013 with its Cow & Gate formula logo (left, image from the event Facebook page). At the same time, Danone is rationing its formula in the UK claiming it cannot meet demand, which has been denounced as a strategy to gain media coverage and circumvent restrictions on direct advertising of infant formula. Danone is facing a new competitive environment in both Ireland and the UK since December 2012 when Nestlé completed its takeover of Pfizer Nutrition and its Wyeth subsidiary, the company behind the SMA brand. Nestlé is already offering price discounts and targeting health workers with training events. 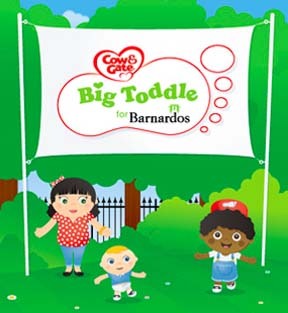 In what could be the first salvo of heightened competition in Ireland, Barnardos Ireland is working with Danone to encourage crèches, parents and childminders to organise Cow & Gate Big Toddle events, so promoting the formula brand direct to Danone’s target groups. 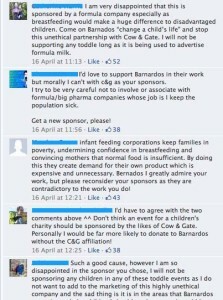 Baby Milk Action has written to Barnardos Ireland to remind it of internationally agreed marketing restrictions for formula brands and to enquire whether due diligence has been conducted in entering into this arrangement with Danone, which has already led to parents saying they will not take part in this year’s events. It will update this page if a reply is received. Danone leaped into second place in the global baby milk market behind Nestlé with the takeover of the NUMICO brands (Nutricia, Milupa Cow & Gate, Aptamil etc.) in 2007. Danone has become a major source of violations of international marketing standards as it attempts to compete with Nestlé. Nestlé is the target of an international boycott for its activities and Danone has been warned by campaigners that it may also be targeted with a consumer campaign, which has prompted it to change some practices. Save the Children documented in its February 2013 report on breastfeeding that Nestlé and Danone are particularly aggressive as they compete in Asian markets. Similar tactics are now emerging in the UK and Ireland following Nestlé’s entry. Both the UK and Irish Governments have failed to meet their obligation to implement the marketing requirements in national measures. At the end of 2010 the Irish Government announced it was supporting a €50 million extension to Danone’s manufacturing facility in Macroom, County Cork, through Enterprise Ireland. Prior to Nestlé’s entry into the Irish market, Danone’s support for Barnardos Ireland was in its own name. 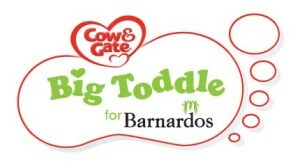 This year’s event and Barnardos home page is branded with the Cow & Gate formula logo. Baby Milk Action’s new report Look What They’re Doing in the UK 2013 includes a page specifically on how companies use brand promotion in an attempt to circumvent advertising restrictions on formula. Companies also seek channels to sign up pregnant women and mothers to send them information on infant milks. The image shown left is an example of how these emails are used to advertise infant formula in violation of marketing requirements and UK national measures (full details in the monitoring report). Danone generated massive media coverage for its brands in the UK in April 2013 by claiming its formula is so popular stocks were running out as people were buying in bulk to export to China. This has been denounced as a marketing strategy and a sign of the increased competition with Nestlé’s entry into the UK market – see press release: Danone v. Nestle formula marketing war reaches the UK. Instead of highlighting that an EU Export Directives prohibits such exports because the products are not labelled in the appropriate language and so endanger babies, Danone encouraged supermarkets to introduce rationing for all customers across the UK, generating publicity in the mass media and creating panic buying. Meanwhile the Department of Health investigated and stated: “We have confirmed that there are sufficient stocks of infant formula for the UK and parents should continue to buy formula milk as usual.” Nestlé stated: “We do not have any evidence of bulk purchase of SMA for export” and put it on price promotion in UK supermarkets, in breach of the marketing requirements. Danone supplies the UK from Ireland, where no shortages or rationing are reported. Nor has rationing been reported in other European countries supplied by the same factory as the UK. Did Barnardos Ireland conduct due diligence? 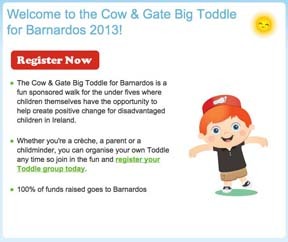 Barnardos Ireland is specifically targeting creches, parents and childminders with the Cow & Gate branded event (website detail left). 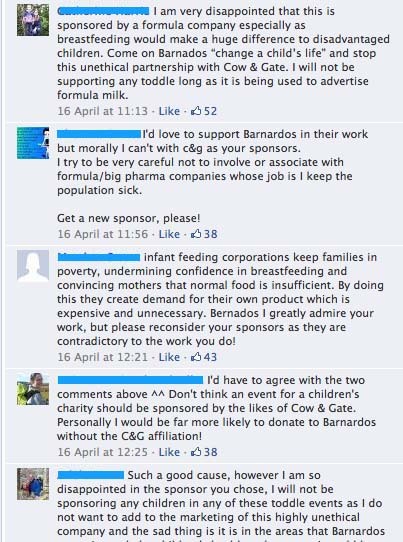 “At the same time that Danone is claiming in the UK that it has problems supplying formula from its factories in Ireland, it is engaging in this high profile promotion of the Cow & Gate formula brand to mothers with young children through Barnardos Ireland Big Toddle event. I have contacted Barnardos Ireland Big Toddle team about this promotion and am awaiting a response. It is probably not a coincidence that this change comes as Nestlé, Danone’s leading competitor around the world and the most aggressive of the baby food companies, takes over the marketing of the SMA brand in Ireland. “As companies that systematically violate the World Health Assembly marketing requirements, neither Nestlé nor Danone can be viewed as suitable sponsors, even in their own names. As baby milk manufacturers they are even more inappropriate when it comes to events targeting parents with young children, due to the conflicts of interest. Baby Milk Action recommends that all organisations seeking donations and sponsorship put in place a transparent ethical funding policy. The guidelines for trustees from the UK Charity Commission provide advice on this. Baby Milk Action has reluctantly reported several UK organisations, including the British Red Cross and the London Marathon to the Charity Commission over their links with Nestlé, as well as highlighting inappropriate sponsorship by Danone. Until Nestlé entered the Irish market, Danone sponsored the Big Toddle for Barnardos in its own name (detail from the 2012 bunting, left), rather than promoting a formula brand name. Such promotion gains a company that is breaking marketing requirements around the world an improved image by association. While this sponsorship was also inappropriate, Danone’s switch to directly promoting the Cow & Gate formula brand in 2013 demonstrates how a country with poor regulations in place is ill equipped to stop aggressive marketing when competition becomes more intense and standards are driven down. A comment is awaited from Barnardos Ireland.